The most renowned olive oil is the “extra virgin olive oil”. 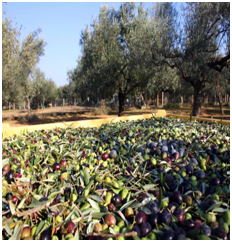 It is produced straight from the olive drupes by cold extraction (temperature lower than 27˚C) and only by mechanical means. This means that olive drupes have not undergone any other processing, apart from rinsing, extraction, transfer, centrifugation and filtration.This process reassures that the juice extracted from the olive drupes is consumed without other chemical additives or mixing. Moreover, “extra virgin olive oil” signifies that olive oil acidity should not exceed the 0.8 gr/100 gr. It should be noted that our products very rarely exceed the 0.3 gr/100gr of olive oil, and this is the case only when the weather conditions are very bad. 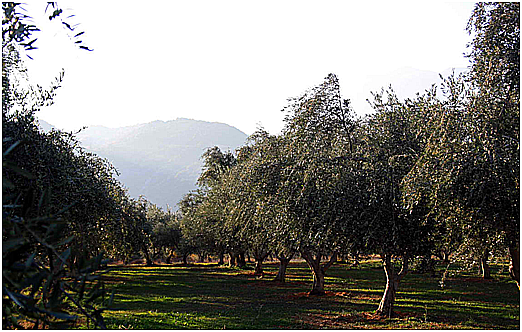 Apart from the above, other important contributors to the quality, the taste and the health protection capacity of olive oil are the different varieties of the trees, the cropping methods, the time and the way of harvest, the storage, as well as the standardisation of the product. Do we really want natural products in our plate or could we get away with plastic food? Extra virgin olive oil, as indicated in product labelling, is produced by cold extraction and by the use of mechanical means only. This certifies that the product in question is indeed natural. Scientific Methods for Quality Measurement . 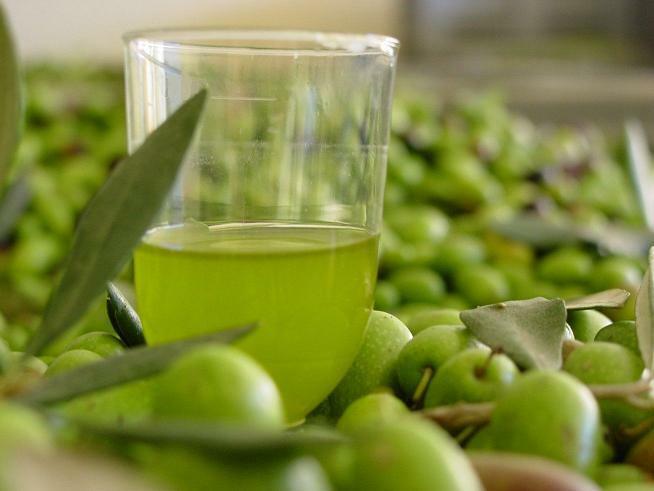 The quality and the origin of the olive oil are defined according to its physiochemical and organoleptic profile. The quality of the olive oil is defined by a panel test and the measurement of a number of physiochemical parameters (acidity, peroxide, components of absorption [K270/K232/ΔΚ] etc.). This evaluation for the final product follows scientific as well as European laws. The main alterations of olive oil are observed upon hydrolysisor oxidation. Hydrolysis or hydrolytic rancidity appears mainly during the extraction of the olive oil from the drupes. It has to do with drupe collection and exposure of the harvest to unsuitable weather conditions until the time of extraction. Damaged drupes, inappropriate bags for harvest, delayed oil extraction from the cut drupes under conditions of high temperature or humidity; all these factors are damaging for the quality of the final product. These factors free fatty acids from olive oil glycerides and are related with acidity increase and taste alteration. Oxidation or oxidative rancidity mostly takes place after the olive oil has been delivered, and it is very often observed while olive oil is stored under inappropriate conditions. It changes the organoleptic characteristics of the olive oil (smell, taste), while it also alters its natural benefits, such as viscocity. Main contributors in oxidation are: oxygen (ambient air), high temperature, light and metals (storage and packaging). Our crops and the greatest part of our products are labelled as products of organic agriculture, Golemis farm. 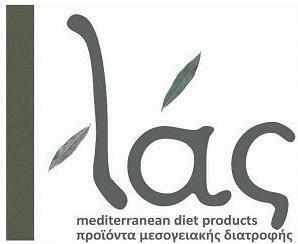 We are also involved with conventional agriculture (integrated management), Giorgos Diamantakos farm. The climate and soil conditions in our homeland constitute tree pruning necessary for maintaining a relatively small tree size, so as to reduce their need for water. The only soil improvers we use are green manure with vicia sativa and lupin, and organic manure (every two years) with a good quality compost from organically bred poultry. 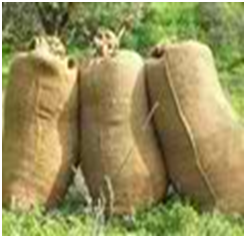 We do not beat the trees to accelerate the drupe collection procedure, which is often the case in other areas. Tree beating damages the trees and their fruits. Most of the productive branches of our trees are cut and the selection is made by a special machine. This is the first pruning, thinning, of our olive trees. This way of pruning during the period of harvest, or a bit later, requires a lot of care and experience. 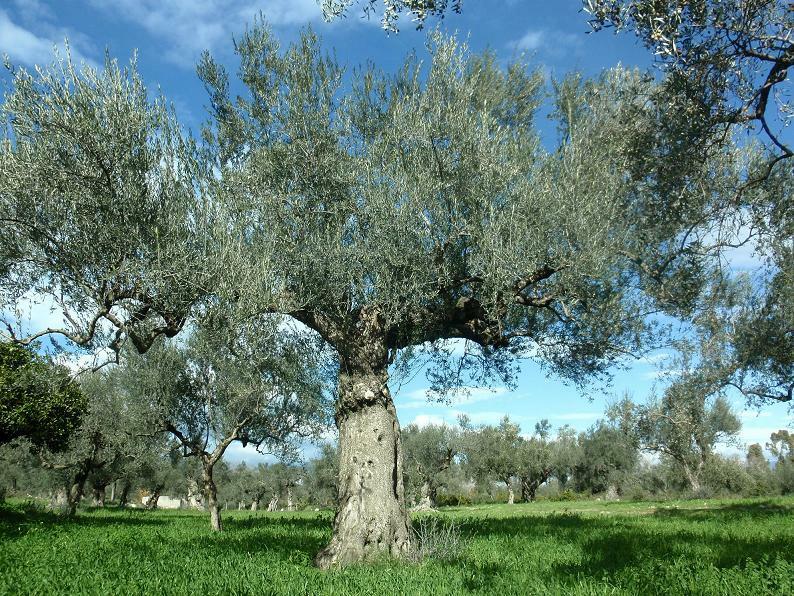 Olive trees should not remain fully exposed to the weather for the entire winter; however, when covered/exposed, the tree should breathe well and ts canopy should be exposed to sunlight. 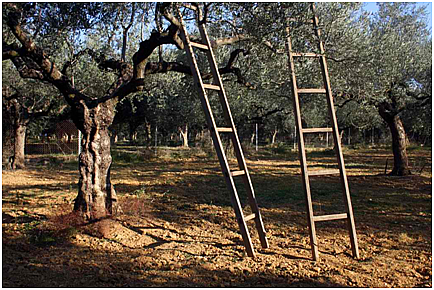 Lastly, olive trees need preparation before spring; for a balanced ratio (according to the age of the tree) between the tree trunk and its canopy (branches with leafs), and its roots. For our ultra premium variety of olive oil, drupes are carefully selected; we give particular attention to the soil and the trees themselves. The ultra premium variety of olive oil is extracted separately and within 10 to 12 hours of harvesting; the same happens with all organic agriculture harvest. 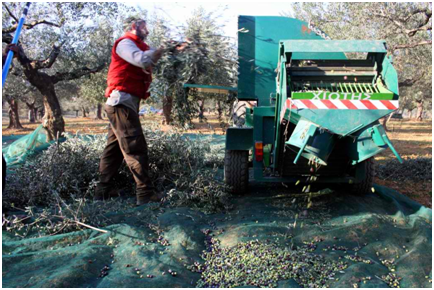 The olive drupes from our conventional crops are being extracted within 24 hours of harvest, at the oil mill of Farmers Union of Paleopanagia; all farmers of the union give olive drupes to the mill for extraction without distinguishing their harvest. 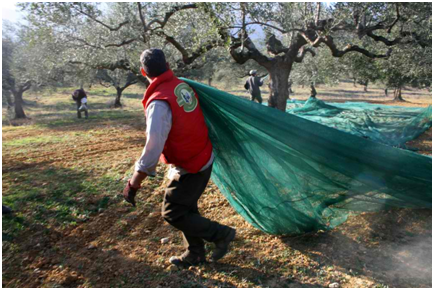 This method forces farmers to stick to a common cropping behaviour that reflects and raises the quality of the olive oil of the area. Right after the extraction, olive oil is stored in stainless steel tanks. 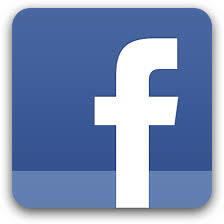 Standardisation takes place at a certified factory of the area, which is equipped with modern mechanical means.